Texas Online Radio: Update 1.6.2012- Suspect Charged in Midland Airport Explosives case freed on bond. Update 1.6.2012- Suspect Charged in Midland Airport Explosives case freed on bond. NBC-17 Wants To Know: Was there a breakdown in security at Fayetteville airport? 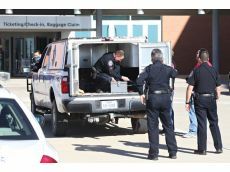 MIDLAND, Texas—Authorities have charged a member of the U.S. military who was arrested after trying to go through a security checkpoint at a Texas airport with explosives in military-grade wrapping, the FBI said Sunday.